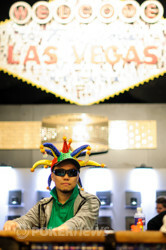 On Saturday afternoon, a field of 2,302 players turned up for Event #19 of this 2012 World Series of Poker. The buy-in was a moderate $1,500, but the big field created a hefty prize pool of more than $3 million. More than a half-million dollars of that awaited the eventual champion, and that comes with the priceless gold bracelet. This evening, we crowned our champion. Cliff Goldkind is a 24-year-old student from Potomac, Maryland. Tonight, he's a WSOP bracelet winner. After one of the quicker Day 3's of the Series, Goldkind knocked off the gregarious Kennii Nguyen in the final duel to get his first taste of live tournament glory. When this day began, there were still 17 players in contention. Apart from our two finalists, notables such as Philippe Boucher, Jason Wheeler, Barry Shulman, and David Peters were in the hunt. Boucher barely escaped the first level of the day before meeting his end. He three-bet shoved with his short stack and . Adria Balaguer had opened with , though, and a board full of blanks sent Boucher off in 15th place with $25,048 as a consolation prize. He won his first bracelet at the WSOPE in Cannes this past year, but his second will have to wait for now. Wheeler chipped up to a million rather quickly in the early stages, but he soon found himself open-shoving into a pot with less than half that count in front of him. He showed down when he was called, and Justin McGill's were too much. Wheeler had plenty to sweat on the board, but he could not find an out to stave off an 11th-place exit ($31,916). The final table of nine was set up under the bright lights of the Pavilion's secondary featured table, and the rest of the day would hum along rather quickly. Gary Burks came into the final table with the chip lead, but he was the first to depart. Within a few hands, Goldkind had overtaken him, and the two played a monster pot with nine players left. Burks got it in with , but Goldkind found and snap-called for the knockout. The dealer made things fantastically interesting, though. The flop was a partial hit for Burks, and he caught lightning in a bottle when the turn brought the . Now he was left to fade the remaining diamonds and the ace left in the deck, but that was too tall a task. The river gave the monster pot back to Goldkind, and Burks was left pacing toward the exit doors with $41,145 for his final-table run. From there on, the eliminations came at a torrid pace. Shulman was next to fall. He had gotten himself in push-fold territory, and his third shove did not go uncalled as the two prior had. The elder statesman of the table moved in with in early position, and it was Goldkind who did the deed. He found aces again, and his were too much for Shulman on the board. 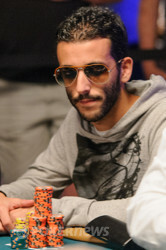 Shulman left to a nice ovation in eighth place, good for more than $50,000. Moments later, Peters got his chips in with against Patrick Smith's , and he could not catch up. The board was the last of his day, and his third career WSOP final table appearance paid him out more than $70,000 for a seventh-place finish. McGill brought a group of friends up from Phoenix, Arizona to sweat his final table, and he gave them a good performance before ducking out in sixth. He had about 20bb when he shoved in with . Balaguer quickly called with , though, and the flop was about as good as he could hope for. McGill could not find the case eight or running aces, and his day ended right there. For his efforts, McGill and his friends were handed $94,815 to enjoy a night out in Las Vegas. Gregg Wilkinson left in fifth place with the first six-figure payout of the event — $128,441. It was a flip of the coin with his looking to outrun the of Balaguer. They could not, though, as the board gave Wilkinson his marching orders. Just minutes later, Smith got the last of his stack in with on a flop. It's hard to fault him for that, but Goldkind had flopped better with his . Smith could not find any help on the turn and river, and his fourth-place showing was good for more than $175,000. Balaguer was getting short on chips by that point, but he did manage to double with against Nguyen's . Just one hand later, though, he was out in third place. Goldkind put him to the test with , and Balaguer's had him poised for a second double in as many hands. Once again, though, the poker gods were on Team Goldkind. The flop put Balaguer under the axe in a big way. He couldn't catch back up on the turn and river, and his first WSOP cash was good for just shy of a quarter-million dollars. That's not a bad consolation prize, in our estimation. Because of the way those last few hands went, Goldkind entered heads-up play with a massive chip lead. The two played just a couple pots before the dinner break, then returned to play for the bracelet. They decided to give us all an early night by getting it all in on the very first hand back. Goldkind's pocket sixes held against the two Broadway cards of Nguyen, and the latter was sent off with nearly $350,000 as the runner-up. It was the moment of victory for Goldkind, and he spent it celebrating in the arms of his friends on the rail. As we soon found out, he wasn't even sure how much money he'd just made. "You wanna know payouts now, Cliff?" one of his friends asked. Goldkind's eyes rolled back in his head. "Oh," he said with an impenetrable grin. "You're halfway to One Drop!" another said. He's already made his own little slice of WSOP history here tonight, and Goldkind's focus on the bracelet paid off in gold. 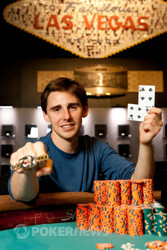 From all of us at PokerNews, we send our big congratulations to the WSOP's newest champion, Cliff Goldkind! It took exactly one shuffle to end the match. 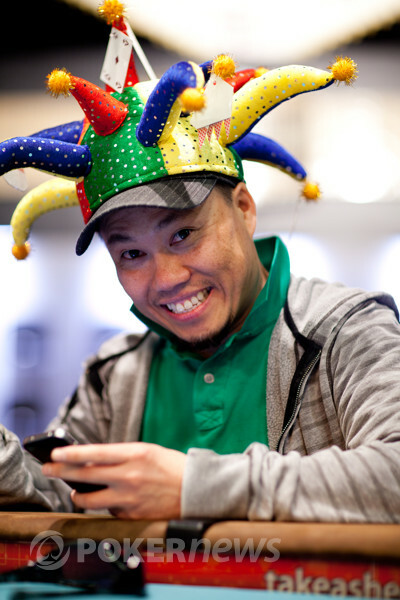 On the first hand back, Kennii Nguyen was dealt , and Cliff Goldkind woke up with a pair — . All in and a call, and the cards were on their backs. The two men stood together in front of their stacks, and Nguyen was yelling instructions at the dealer. "Picture! Picture! Monkey!" But his pleas fell on deaf ears. The board ran , and the last of Nguyen's chips were slid across to his neighbor. Kennii Nguyen put on a great show here today, and his energy was contagious both at the table and here at our desks. For his work this week, he'll win $347,036. You can buy all sorts of crazy hats with that money. Our two men are back in their seats, and the heads-up match has recommenced. 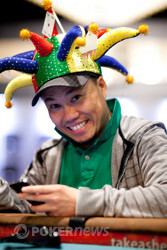 Despite his short stack, Nguyen is brimming with joy and confidence. One hand after after doubling with against Kennii Nguyen's , Adria Balaguer raised to 100,00 in the small blind and Cliff Goldkind three-bet to 300,000 from the big blind. Balaguer fired back with a four-bet to 635,000, Goldkind pushed all in, and Balaguer called off for around 2,600,000. Balaguer was in fantastic shape to take the chip lead. But poker can be a cruel, cruel game. The dealer tabled a flop of and Goldkind's rail exploded when they saw his flopped full house. The turn and river were no help to a dejected Balaguer, who will take $245,197 back to his home in Malta. We'll have the official heads-up chip counts for you momentarily! And then there were three. 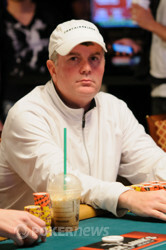 Patrick Smith was first to act preflop and he raised to 160,000. Cliff Goldkind called on the button and the two blinds got out of the way. The flop brought an action-inducing and the chips started flying. Smith checked, Goldkind fired 200,000, and Smith check-raised all-in for 1,220,000. After hearing Smith's total, Goldkind pushed in a call, and the cards were revealed. Cliff had the lead with two pair but it was far from over. Smith flopped a gutshot draw, and he picked up even more out when the fell on the turn to give him a flush draw. But it wasn't meant to be for Smith as the came on the river and he exited in fourth place for more than $176,000. Goldkind is running over this final table and is now sitting behind a mountain of chips. Adria Balaguer opened the action with an under-the-gun raise to 100,000. 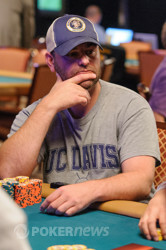 Around in the big blind, Gregg Wilkinson three-bet shoved for just less than 800,000. Balaguer had just bluffed off a big chunk of his stack, so he barely had the shover covered by that point. He paused for just a bit to make sure, then called with a chance at the knockout. The flop kept things interesting for the next two streets as Wilkinson flopped an open-ender. The turn was the blank , and he had one card to find an out. He could not, though. The was the last card off the deck, and Balaguer ends with trip jacks and the rest of Wilkinson's chips. That's the end of Wilkinson's day, and he'll take home $128,441 for his work this weekend. That's not too bad for a $1,500 investment.